When purchasing a guitar, whether it is a new or second hand, there are some issues you should certainly watch. Although the choice of a guitar is especially personal. Electric guitars built in the 50s and 60s are still very popular. But it is certainly not that old guitars by definition better than new ones. For the lifespan of your guitar is good maintenance is essential. Here are some tips for purchasing your guitar and maintenance. Are you planning to buy a guitar, there are plenty of possibilities. Somewhere between a virtually priceless copy and the offer of the month is to be found suitable instrument. Who wants to buy a guitar often getting conflicting advice from friends or acquaintances who think to know it, or traders who usually have a connection with one or several brands. In assessing the quality the focus is on general criteria and not that a Stratocaster would be better than a Les Paul, or vice versa. Below are a few factors you need to consider when you purchasing an electric or acoustic guitar. 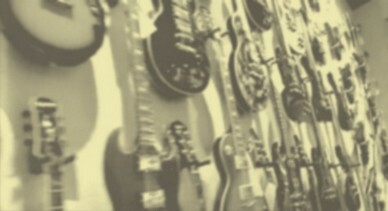 Try to buy a guitar from a reliable and well-known brand. Try to buy a guitar from a reliable and well-known brand. You may assume that the good reputation of a manufacturer, is based on the fact that they make fair to excellent tools. Warranty and service of well-known brands are generally better and it is also easier to get replacement parts. A guitar from a well known brand also continues to keep his value so when you can get a reasonable sum when resale. Make sure that the guitar is well built and that all components are firmly mounted. This is essential for a good sound and intonation. Make sure that switches, potentiometers, inpuet and element at an electric guitar not creak. Should this be the case, ask if this can be remedied. It may be that there is some substance in between, but after rotate a few times and switching is usually gone. You can also help correct it by cleaning these parts with contact spray For example, a good brand is Kontact chemie. The liquid will evaporate in a few seconds and leaves no greasy film behind. Play the frets along and see if they do not bring vibrate. When a note is pressed, the string should not other frets do resonate. 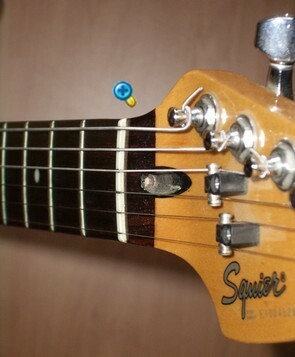 With guitars feature an adjustable nut, you can fix this. Play the same chord in different positions of the fretboard and make sure that the tones in all positions are pure. Make sure the tone on the twelfth fret sounds exactly one octave higher than the tone of the same open string. If this is not the case, ask in the store whether they want to fix it. This is an important part of the guitar. Machine heads (tuners) should run smoothly but yet give a little resistance. If nothing happens by first tightening the tuner and the string then suddenly shoot further, it may be that the string is not correct winding around the axle. The quality of the mechanism is easy to check if the strings are strained slapper or removed. If the guitar is otherwise fine you could the mechanics replaced by machine heads in a metal housing. Excellent quality machine heads for example are brands like Grover or Kluson. Make sure the strings have the same distance apart. With an adjustable bridge, you can see the distance from the strings to the key (action) to set to your personal preference. 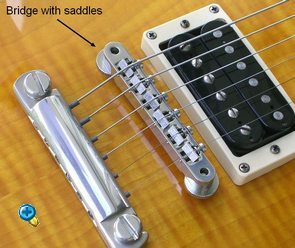 Some guitars have separate mini-bridges for each string. These mini-bridges, both in height and length adjustable. This makes it easier to get a pure intonation. Whether it is a new or used instrument, always ask for the warranty conditions. Most stores offer besides the extra warranty service and set up the guitar for you. There are a lot of maintenance resources available for the guitar. Most electric and acoustic guitars are lacquered. Dirt or grease deposits on acoustic guitars muting the sound. To remove dirt and make it shiny, there are special products. 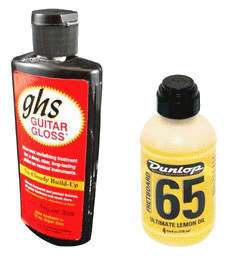 A good product for example is Guitar Gloss of GHS. Also for the fretboard, there are special cleaners such as Fretboard 65 of Dunlop. Rubbing the fretboard well with a cloth to which a few drops are arranged in the longitudinal direction of the neck. Let the fretboard dry and rub then the fretboard with a lint-free cloth. Metal parts to an electric guitar that a lot are touched as machine heads, elements and, if present vibrato handle may be adversely affected by perspiration and will oxidise. These components must therefore always be wiped clean. And of course this also applies to the metal strings and frets. Almost all electric guitars have a bridge whose height is adjustable. The bridge usually has two set screws with springs, but there are also models that you can adjust with small wheels. Many models have a bridge that allows you to set each string separately. In that case, the bridge consists of six individual particles which you can set by means of adjusting screws higher or lower and can extract forwards or backwards. A bridge can sometimes shift from its place as the strings are stretched weaker. If your guitar tuned in an open E sounds perfect but a barre chord on the middle of the neck of tune hopeless, then you need adjust the string length by using the bridge. If you turn the screw of a particular saddle it moves forward or backwards. This lets you correct an incorrect intonation. The metal strengthening in the neck (truss rod) creates a torque approximately 4kg. per centimeter. The torque can be adjusted with a screwdriver or hex key. Most guitars have a plate on the front of the head including the the truss rod. On other models, including many Fenders you can adjust the rod to the other side, at the place where the neck merges into the body. Note: Tighten the adjustment nut of the truss rod never more than a quarter turn at once. Then wait a few hours before you can notice the effect because the neck (wood) needs time to focus. Posing the neck is done with the strings tension. To get the neck straight, turn the adjusting nut with a hex wrench clockwise. If the neck is rounded, turn the adjusting nut counterclockwise to get the neck more hollow. * The strings are old so that the elasticity ia declined. * The strings have been set up sloppy. Please note when setting up new strings that no buckling arises in the string. A small bump in the string making that spot weak and will have the effect that the string breaks easily. Do not over tighten the string, thicker strings can be tightly strung but play also more heavily. Note also there are no any burrs are on the bridge, saddles or comb. In this case, use a fine sandpaper to abrade them round and smooth. Small gradual changes in the weather can no harm, but sudden temperature and humidity changes can be especially damaging the finer woods. Woods like rosewood, maple, cedar and mahogany are used for their resonance properties and strength. However, these types of wood absorb the humidity. The guitar consists of a single unit from each counteracting tensions that keep each other in perfect balance. If some parts shrink at temperature changes or expansion than other parts could be result problems. Too much humidity can make the wood expand and glued parts soak off. A sudden extreme drought or high temperature, the wood will shrink or bursting. If the guitars leave the factory they are quite dry because the premises where they are made, the temperature and humidity controlled. Maximum humidity of 60% to 85% for guitars with steel or nylon strings by manufacturers considered as safe. To create these conditions, you can put a damp cloth or a special humidifier in the strings section of your guitar case, and the guitar will not dry out. In a humid climate, you can get a bag of siliceous earth present in the guitar case so that the guitar not absorb too much moisture. Of course you need a stringed instrument never lay close to a heat source. If you're from a cold room go to a warm room, leave the guitar in the guitar case so that the may gradually acclimatise. If you're a lot on the road with your guitar a protective covering is essential. There are cases and covers, but covers are not recommended if you travel a lot. Guitar cases of compressed cardboard or chipboard offer much more protection than a sleeve. These cases are mostly from the outside lined with imitation leather and the inside of soft material. 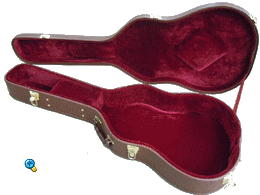 For more expensive guitars it is advisable to choose guitar cases from which are made of reinforced plywood. These are shaped so that the neck is supported, and the body fits into it exactly. The locks, hinges and corner parts are made of stainless steel even as the handles. Also, there are cases which are made of fiberglass. These are extremely hearty and on the inside too coated so that it fits the guitar. It is important that the guitar fits exactly in the guitar case, otherwise it may subsequently damage when it hits the inside. 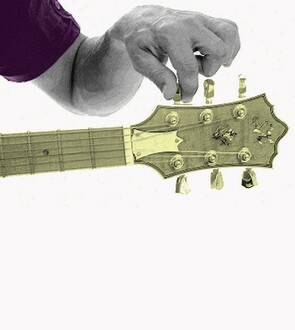 The neck should always be well supported, because there is a risk that the head can snap if you drop the guitar case.